Hotel is approx 200m up the road on the right hand side. I rate it 4 stars. Brilliant value for money. Staff were great as was the food. only observation bedRooms a bit dated. Lovely hotel and dinner was delicious, great portion sizes but the noise form the hallway and next door rooms is very loud, can hear everything said in room next door. Lovely stay, staff very nice and friendly would recommend ,looking forward to a return visit . Really enjoyed the stay, staff were very helpful and friendly. Food was excellent and plentiful. The rooms are comfortable and warm. Looking forward to revisiting. Excellent value for money. Great location near a nature walk and the coast/beach. Rooms are clean and simple. The leisure center is great, v child friendly. Would definitely go back again. We a great welcome from reservation staff .Hotel is very modern on the lobby floor but as you go up the bedrooms it gets very shabby in need of total renovation ,Rooms are very clean ,the double bed was very small.we had dinner in the restaurant which was pretty good and plenty of food ,the staff are very good and looked after us very well ,breakfast is self service and was OK, lovely grounds too walk about in and lovely swimming pool.overall,we have no problem in payjng complents too all the staff . We had a very warm welcome and easy registration. The bedrooms are large and are thoroughly made up each day. Our part of the hotel is showing the need for some minor re-decorating, but generally it is great place to stay. The food is good, with breakfast being self-service and and we had evening meals in the bar where portions are generous. Plenty of grounds to explore and lovely walks nearby. No hesitation in recommending the hotel and paying complements to all of the staff. Myself and my young family stayed at The Arklow Bay on Thurs 2nd Jun for 1 night. This very family friendly hotel is in an excellent location right beside a beautiful wildlife sanctuary. The food and service at the hotel were both excellent. We would highly recommend the Arklow Bay to anyone (young or old) looking for a short break close to Dublin. We will definitely stay there again soon. Great location, will be back! Dinner & Breakfast was a good selection & great quality. Hotel entrance was nice . Staff were nice and friendly food was great and the leisure center was great but the room was VERY small and Basic. We arrived in the middle of storm Desmond to the warmth of this lovely hotel! The staff are very friendly, the accommodation is very good and the service exceptionally quick with fresh and tasty food. We will be returning! I love this hotel. I was there with 3 of my daughters, their partners, my husband and 6 grandchildren. An excellent time was had by everyone. We will definitely go there again as soon as we can. The staff were lovely. The restaurant and bar food were excellent.The bar staff and all the staff get 100% for their service. I have just returned from my second stay at the Arklow Bay Hotel this year and looking forward to my next visit which I hope will be before the end of November. The staff were delightful pleasant and helpful at all times. The food was excellent during both stays so yes I would strongly recommend this hotel. Amazing views and walks and very restful and accommodating. I have just returned and looking forward to my next vacation there. I traveled from Limerick and collected a very elderly lady who also enjoyed her second visit there. Keep up the good work. Kind regards to management and Staff. I found the facilities very good and thought the bar food was really nice. M only problems I found was there was now information booklet in the room and found the bed very small. But I would really recommend the hotel and would definitely return. Excellent service nice food ,love to go back again .CLEAN HOTEL .good rooms. Very happy with all aspects of hotel. Staff very helpful and cheery.very relaxed atmosphere around the foyer, bar and restuarant.good crowd around at all times which added to atmosphere. Food very good and reasonable. July 10th Really enjoyed our stay. Staff are very friendly and great views from the hotel and you can walk down to the sea. They made us very welcome and great choice of food. I have been there before and will go back again. I traveled from Bray Dart Station to Arklow. Turn left outside station walk 5 minutes to the bridge where there is a big Bridgewater Shopping Centre with Abrakebabra/Eddie Rockets and loads of other eatieries, great clothes shops and a huge Aldi too. Cross the bridge and the Arklow Bay Hotel is 5 minutes from here. The hotel is big and full of coach tours all the time (mostly elderly) but thats okay as they are quiet....Walls are very think in the hotel, wifi is available free of charge in the hotel rooms also. Breakfast is nice but starts at 07:30am so you need to be there by 8:30 at latest to get a decent serving! Bar food unfortunately ends at 20:30pm very early and entertainments starts in the bar at 10m for an hour!! Receptionist were all lovely and very helpful I got there at 11:30am and she gave me a towel to go to the beach and she minded my luggage or you can go into the leisure centre on the premises with a great pool, jacuzzi and sauna etc as you really wont get checked in before 3pm!! Checkout is 12 noon but they give you a complimentary hour so 1pm which is great as I went to Brittas Bay beach both days and on the last day again then came back and showered etc in the leisure centre before heading home. Lovely bars up the town a drive thru McDonalds the biggest Tesco Extra store Ive ever seen which is open til midnight. All in all between walks around the lake in the hotel, beaches within 10 minutes drive and the town being lovely I really enjoyed it in the good weather we had and will defo go back again! Stayed overnight on way from Rosslare. Excellent location - we were able to walk our dogs on the beach evening & morning (dogs stayed in the car!). Very good food with good selection & generous portions. Nice bedroom - comfy bed & bathroom was fine. Safe parking. Friendly staff & would stay again. Great value for money with DBB break. 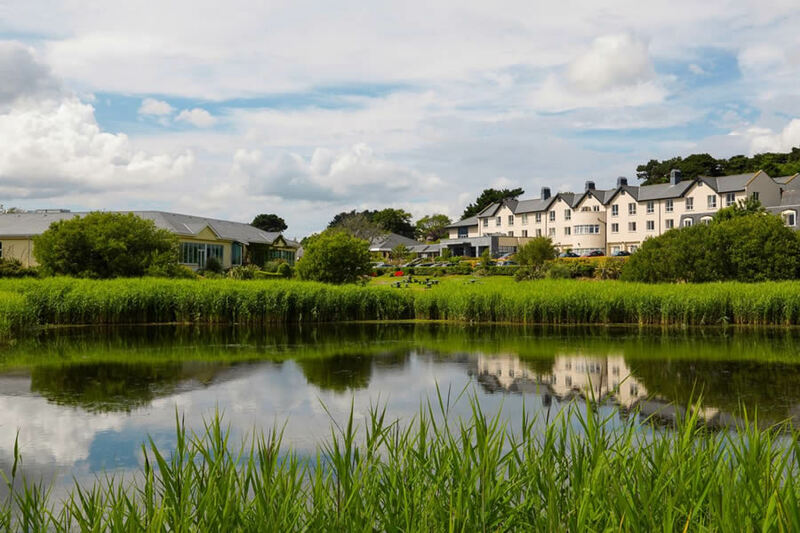 We greatly enjoyed our short break in this friendly hotel, which has a superb location that makes it very convenient for exploring Wicklow -- Brittas, Avoca and Glendalough, etc. The hotel has very good leisure facilities, an excellent restaurant and was recently upgraded. Overall, we'd give the Arklow Bay a four star rating (our family room was at the back of the hotel) and look forward to our next stay. Had a wonderful overnight stay in the Arklow Bay Hotel. Staff so friendly and helpful and our evening meal was excellent . I will go back again soon. Very nice quaint hotel. The staff really make this hotel great, they are all lovely, friendly and professional. The food is very nice and the evening entertainment in the bar (one lady band!) was really amazing! The leisure centre is lovely and relaxing too and again the staff there are lovely. Hotel was lovely and clean, the staff couldn't be more helpful. Enjoyed my stay there. Overall very happy with hotel staff and hotel in general. The food in the restaurant was really good. There was a mix-up with our mains and we were more than compensated for this. My only drawback was the lockers in the ladies pool area, they had no locks. We had asked before we went in and were told the lockers cost €1, but in the ladies there was no form of lock, just a hole in the door. So make sure not to bring any valuables to the pool. Did enjoy the stay and would go back. The Arklow Bay is a lovely hotel ,in a good location,nice clean rooms with a nice bar.Doesnt really cater for vegetarians on their menus,best thing about the hotel is the leisure centre,its fantastic with lovely staff.My only problem with the hotel is the 1st night i stayed ,we were seated in the bar for dinner as it was too quiet to open the restaurant,which was fine and i asked the gentleman that checked us in could we eat there the 2nd night as we were meeting friends and wanted to dine with them,he said no problem.The 1st night we nearly missed dinner as when we asked to order was told the kitchen had shut,it was 8.25 but they decided to give us the dinner.the 2nd night when we went to order we were told we couldnt eat in the bar.After speaking to a manager we were allowed to eat in the bar but pay an extra 12 euro.WE had paid for a 2 course meal with tea but we paid it anyway.I found the manager very uncooperative and rude but apart from that I would recommend this hotel. Overall a very pleasent stay here . we had no reason to complain at all and would return in the future. Very comfortable bed...Very friendly staff, good sized lobby. The choice of food in restaurant was very good and bar food very reasonable...Will definately visit again. We enjoyed our break very much the hotel and staff were excellent. Had a fantastic stay at the Arklow Bay Hotel, staff were great, food was great, location excellent plus my daughter lover the kids club. Only negative I have is the pool was very cloudy and murky, Didn't look great as the first thing that comes to mind is dirty. Excellent stay hotel spotless spa treatments were brilliant really enjoyed the stay . Staff were more then helpfull the only negative thing I felt was the dinner which was of poor choice and not very nice. Great night and a great family get together. The entertainment in the bar at night was very good. The rooms are basic but adequate (no frills). The only disappointment was the restaurant. It was a very limited menu, which when we arrived one course had already been changed. Again it was adequate but not great. The bar food looked way better than the food we had. All in all, nice place, friendly staff and lovely location. I really enjoyed my stay there.The room was clean and comfortable.The bar food was delicious and the waiting staff were extremely friendly and helpful.However I have one criticism which is that there were children running around in the bar at 12 at night which is far too late.I was concerned about their safety and couldn't relax having a drink.There was a sign outside the bar stating that children should be off the premises by 9pm but this was not adhered to. Really enjoyed my stay here. 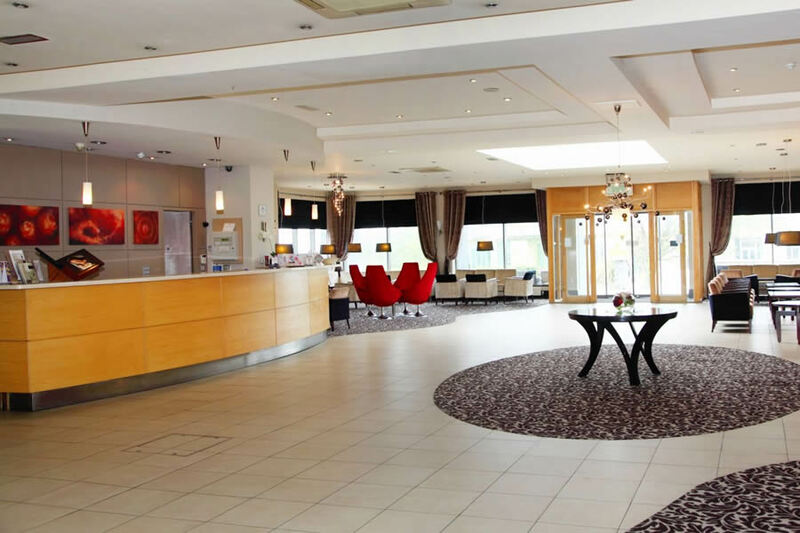 The hotel is in a great location within walking distance of Arklow Town. The leisure center is really nice as too is the pub and restaurant. Rooms are well decorated with good space and a wonderful view. I would definitely go back.